On sale! (normally $199) Das Keyboard Model S Professional Tactile Click for Mac sports gold-plated mechanical key switches, a two-port USB hub as well as Mac specific special keys. 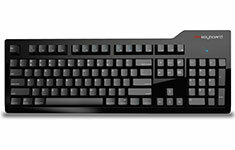 This model has the Cherry MX blue mechanical key switches for maximum clicky tactile feel. 1 year warranty.